One of the easiest plants to grow in the garden is the bean. The two basic types of beans are bush beans which are low growing plants that tend to produce crops all, and the other type is the pole bean. Even though pole beans are more susceptible to frost than the bush bean and they can longer to produce, they do have their advantages. 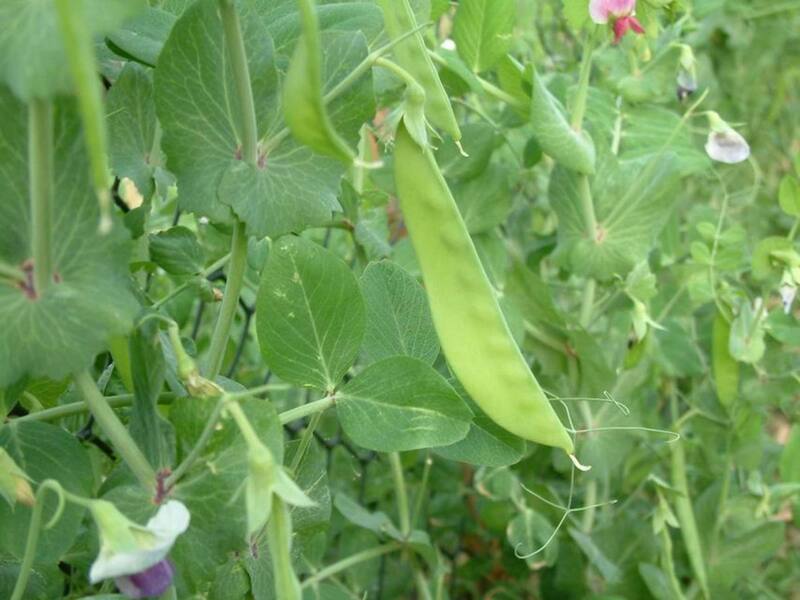 If picked regularly, pole beans offer a steady supply of beans throughout the season. Pole beans also grow vertically, so they are an excellent for a small garden with limited space. 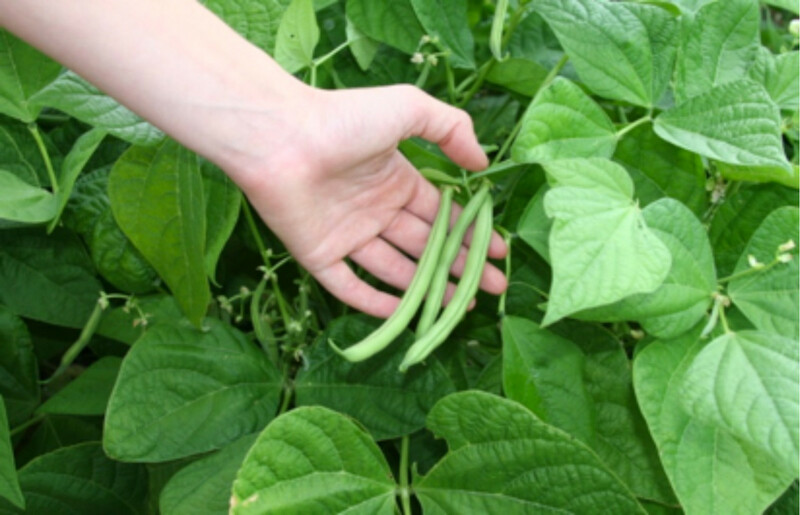 By planning your garden with a combination of bush beans, pole beans will allow you to have fresh beans from your garden from the time the first bush bean plants produce until the first frost. In addition, canning green beans or producing dried beans can provide additional servings of this vegetable throughout the winter months. As a garden vegetable, beans require little care. 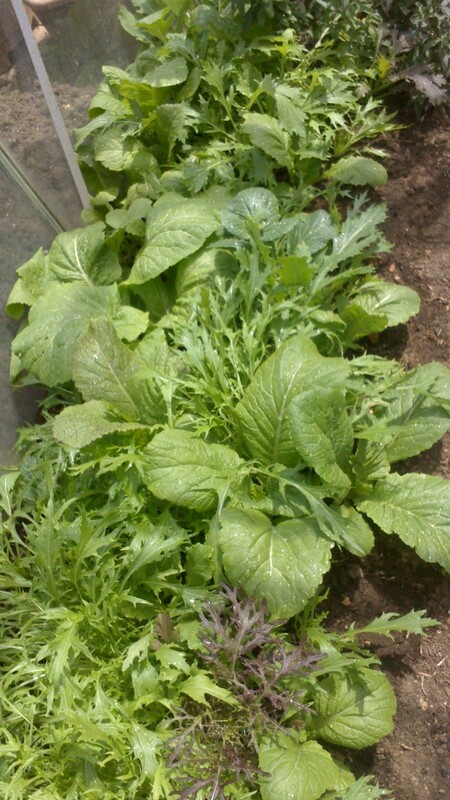 In addition,this vegetable makes aperfect candidates for organic vegetable garden because in addition to producing abundantly, beans also fix nitrogen in the soil. 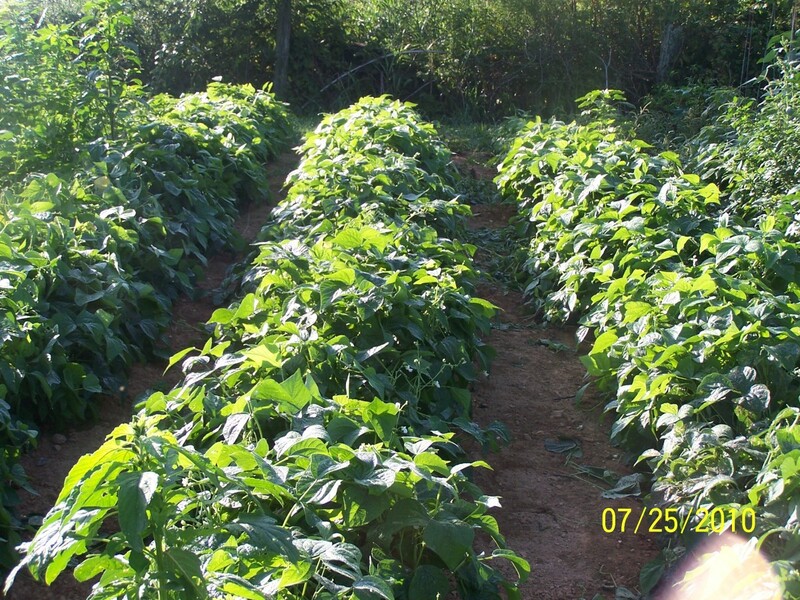 Hundreds of varieties of pole beans are available so that variety is a good candidate for every part of the country. To make growing pole beans easier to pick plant next to vertical supports such as brush or bamboo poles, fencing, and even growing corn stalks! All types of beans exist. For instance, there are the more common limas, and snap beans, but other types of beans can also be grown such as adzuki, garbanzo, fava, mung, and lentils can also be grown. In addition to being divided into bush or pole beans, beans types are also divided into whether they are shell beans grown for their nutritious seed or snap beans which are cultivated for the green bean pod.All beans are legumes which along with peas fix nitrogen in the soil. Because pole beans are extremely sensitive to frost, wait until the air temperatures remain from 70-80 degrees F. and danger of frost is past. Beans placed in the cold ground will rot and beans need sunny well drained soil with lots of compost worked into the soil. A 100-foot of bean row produces about 50 quarts of beans.Since beans are self-pollinating, you can also grow cultivars side by side with little danger of cross-pollination. However, to be on the safe side, if you plan to save seeds from your beans, separate the different types by at least 50 feet. Bean seeds have about a 70 percent germination rate, and the seeds remain viable for 3 years. Do not soak or pre-sprout seeds before planting. If you plant in an area where beans haven't grown before, dust the seeds with a bacterial inoculant powder to guarantee beans nitrogen fixing abilities. Determine your location and secure your trellising material in place before planting pole beans. Look at planting your beans along fences or in a teepee shape. (An alternative is to plant pole beans in a three sisters garden with corn and winter squash or pumpkins. See link below) Dig a row about two deep and six inches apart and water row well, sprinkle kelp powder along row, then plant the seeds. Plant your seeds two inches deep double rows spaced 6 inches apart. (one on either side of a fence if possible. Tamp the soil over the seeds to ensure soil contact. Your pole beans wlll germinate in about fourteen days. Remember to maintain adequate watering until the plants are about to blossom. If the soil dries out, your harvest will drastically reduce. Water one inch of water at least once a week during periods of no rain. After the seedlings emerge, apply several inches of mulch to maintain adequate moisture, reduce weeds, and cool soil during hot weather. Some of the insect pests that attack pole beans include aphids, cabbge loopers, corn-earworms, European borers, Japanese beetles, leaf miners, cucumber beetles, and Mexican bean beetles. The idea in organic gardening isn't to eradicate pests in the garden, but to control them. A few leaves eaten by pests is nothing to worry about. Your job as a gardener is to let the insects know that you are there to claim your fair share. Your best offense in getting your share of your green beans is to first provide a healthy soil in which to plant your beans. Also, laying a thick layer of mulch around your beans will help prevent certain pests like the striped cucumber beetles from being able to lay their eggs in your garden. If necessary, cover plants with row covers and hand pick any adults from plants. Spider mites live on the underside of leaves and they cause yellow stripplings on the leaf surfaces. 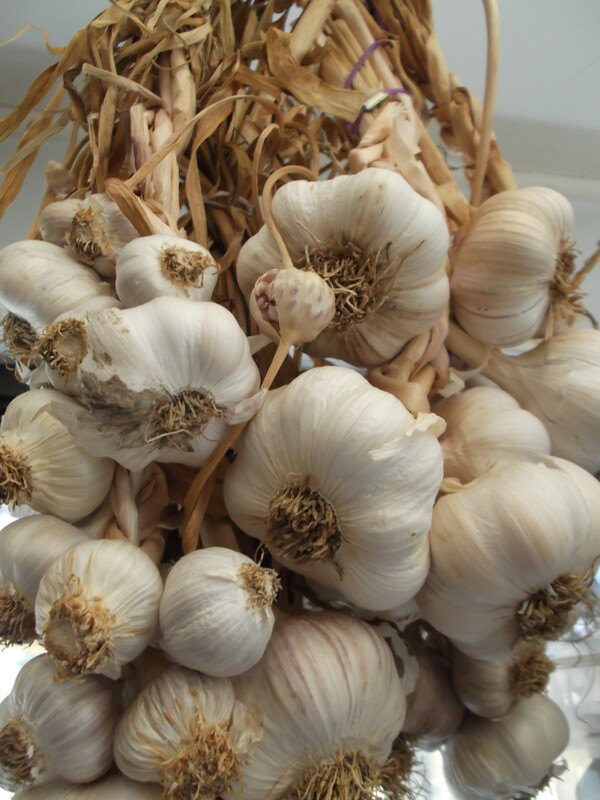 To discourage spider mites as well as aphids, spray with garlic or soap sprays or a mixture of both. To limit diseases, never plant green beans in the same area that you planted them or peas the previous year. Also never handle foliage when the plants are wet from either rain or dew. Follow this advice and you'll have very few disease problems in your beans. If disease does strike, burn infected plants and wash hands before handling anything else in the garden. Do not plant beans in that area again for three to five years. Pick beans for green beans when they are about the size of a pencil and while still tender, before the seeds begin to develop in the pods. Harvest daily to encourage production. Cut off rather than pull off beans from plants to avoid plant damage. serve freeze, pickle, or can beans the day you harvest for the freshest nutritious value and flavor. Pick shell beans for eating fresh when the pods are plump and still green.Consume or preserve them immediately. 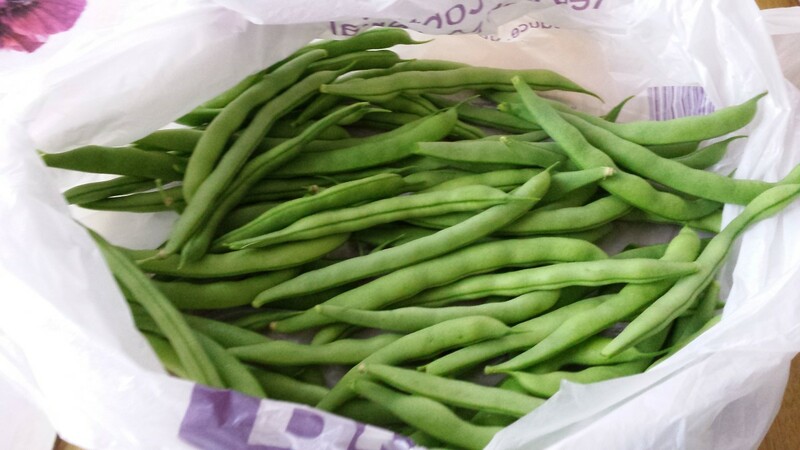 Unshelled, shell beans and green beans will keep up to a week in the refrigerator. For dried beans, leave the pods on the plants until the pods are brown and the seeds rattle inside the pods. Seeds should be so hard you can barely dent them with your teeth. If you are unable to leave the plants in the garden because a rainy period is forecast or frost is threatening, cut the plants near the ground and bring them inside to hang upside down to dry. Once dry, place shelled beans in airtight lidded containers. Canning jars work well for this. include in the container a package of dried milk or oxygen absorbers. Store beans in cool dry, location where they will store up to a year. The basic recipe for canning green beans is simple. Sterilize jars and lids, cut beans to the size you want, rinse off beans, add to jars, add 1/2 teaspoon salt per pint and 1 teaspoon salt per quart. Pour water that has boiled for ten minutes over beans in the jars and fill to 1/4 inch from the top of the jar with water. Run a knife down the inside of the jar to remove any air bubbles. Wipe off tops of jar to remove any type of debris that could prevent the beans from sealing. Apply sterilized lids and rings and then place in on the canning ring in the pressure canner and can according to canner instructions. My canning instructions say that for where I live, to pressure can pints for 30 minutes and quarts for 45 minutes at 10 pounds of pressure. Do not use a water bath canner for canning green beans as green beans are low-acid vegetables. Even if you think that you have a "brown thumb", The bush green bean is so easy to grow that even a beginner grow them successfully. You are right! You can grow plants anywhere! I have even seen fruit trees grown on patios without any soil by using aquaponics! I grow these on my kitchen balcony in a pot. They are great on what I call a wig wam. Who says you can't grow fruit and vegetables on a balcony? Nothing stops me. Thanks! There are a number of vegetables that can be grown in the shade! You're really great at this! If our whole backyard weren't shaded, preventing us from growing anything, I would die to have my own backyard garden again! We've had a couple of nice days too. I put my plants outside during the day to give them sun then I bring them in at night. Tomorrow is supposed to be cold, but it will be warm again on the weekend. Happy Gardening to you as well, my friend! It's almost that time although it froze last night. A few more weeks and we'll be able to start planting here. We always have bumper crops of pole beans; love to eat them straight from the plant. Happy gardening, Donna, and thanks for the information.